If one didn't know better, one might think this was satire. A letter to the editor from Tasmania, Australia as posted on Healthy Transport Hobart. Jan Gehl, respected urban planner and architect, apparently "swans around the world disrupting the fabric of unique socities with a cookie-cutter approach and wants to make them all look like Copenhagen and Amsterdam". Now I appreciate good satire and even, rumour has it, enjoy producing it. So often, however, the best satire can be mined from real situations. 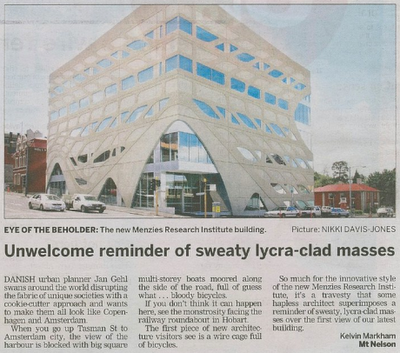 A new building is pictured and the title suggests that it is the latest example of a pile of poo to which flocks of "sweaty, lycra-clad cyclists" will swarm. I'm quite used to getting dissed round about the internet but dissing Jan Gehl is downright silly. Healthy Transport Hobart has a good post about it on their blog. Thanks to Liam Healthy Transport Hobart for the link. Liam and a colleague from Hobart will be at my talk at the State of Design Festival in Melbourne next week. Looking forward!